At this conference the Republic of Serbia was represented by delegation headed by Director General of the Customs Administration of the Ministry of Finance of the Republic of Serbia Mr.Predrag Petronijević, Director of Department, Mrs. Gordana Vidanović and Customs Adviser in Mission of the Republic of Serbia in European Union, Brussels, Mrs. Milena Budimirović. In the course of the event strategic plan, WCO budget, issues connected with activity of global customs network were discussed and report of the workgroup of WCO’s Political Commission has been presented. The Serbian delegation has visited the Embassy the Republic of Serbia in Baku. 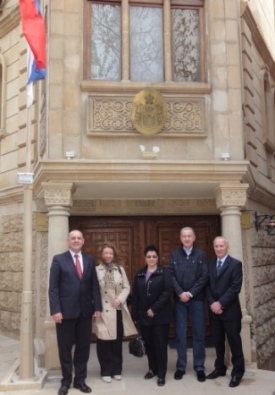 The Ambassador Extraordinary and Plenipotentiary of the Republic of Serbia to the Republic of Azerbaijan Zoran Vajović welcomed the Serbian delegation in the UNESCO historical heritage Old Town – Icheri Sheher, where the Embassy building is located.